Now, when creating a best man's speech, you must walk two fine lines. The first line divides humor and sentiment. Not only do you want to tell stories and anecdotes that will make people tear up, but you will also want to make them laugh. And this is exactly what they will expect from any good best man's speech. The second line divides good anecdotes and appropriate material. A good anecdote should be telling, funny, and possibly embarrassing for the groom. It might contain material that he hasn't told anyone before, but it certainly should be something that would jeopardize his marriage, humiliate him in front of friends and family, or completely change how his mother and father view him. Of course, walking these two lines successfully can be difficult. And this is where a good template can come in handy. Fortunately for you, I've prepared a set of indispensible templates that you can use to craft the perfect best man or groomsman's speech. All you will have to do is fill in your specific information into the templates; and then begin rehearsing. Over time, your delivery will get stronger; and you will feel increasingly comfortable, which will make things easier when the big day finally arrives. Not surprisingly, it can be a challenging endeavor to write a best man/groomsman speech. What's Inside "Wedding Speeches for the Best Man and Groomsman" Guide? 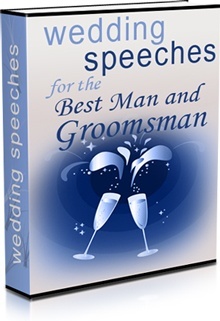 In this downloadable book, I've covered 10 complete best man and groomsman speeches which you can simply pick and choose to make your own memorable speech. I have provided exact templates for the speeches -- All you'll have to do is fill in the blanks and modify the template to make them fit your particular situation, tone and style. Know exactly what to say. You simply customize it the sections like: "Now, a mere [number of years bride and groom have been together], here I am, delivering a speech at their wedding. And I couldn't be happier for you both." Know precisely what to do like "Point to the bride. - Isn't she stunning?" - so it not just tells you what to say, but also shows you exactly what to do. You'll find these "gestures" throughout this guide. Writing a good best man's speech involves some wit, humor, and a vast store of anecdotes. It also involves trading off objectives and walking a fine line between funny and simply inappropriate. Another two important components of any best man or groomsman's speech are tone and mood. Without these two elements, it will lack direction and emotion. For these reasons, I have divided all of the speeches into categories along these lines. Each speech broadly falls into the "sentimental," "funny," or "sentimental/funny" category. Remember to keep this in mind when selecting your template. Look, you could go around doing all the research yourself and get frustrated over what to say in your speech, and waste all your time, or you could simply download this guide today which gives you 10 ready-made best man and groomsman speeches that you can simply pick and choose yourself. That's a steal of a deal, considering you'll get instant access to 10 pre-written best man and grooms man speeches you can pick and choose.